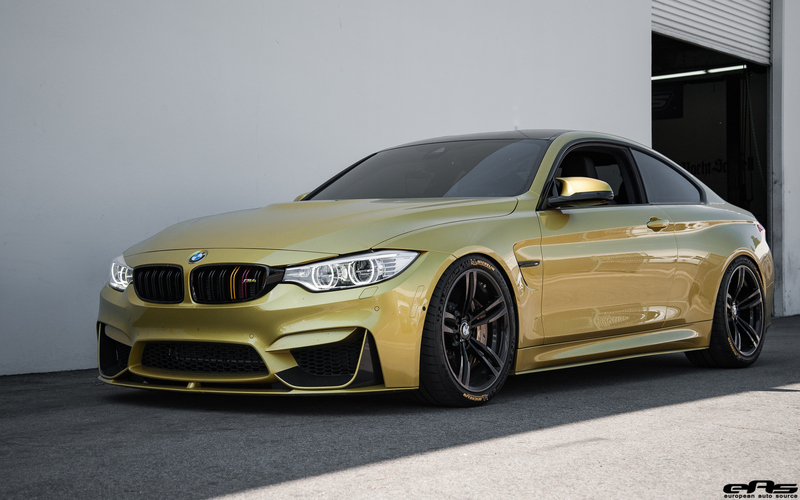 Austin Yellow was one of the launch colors available for the new BMW M3 and BMW M4. 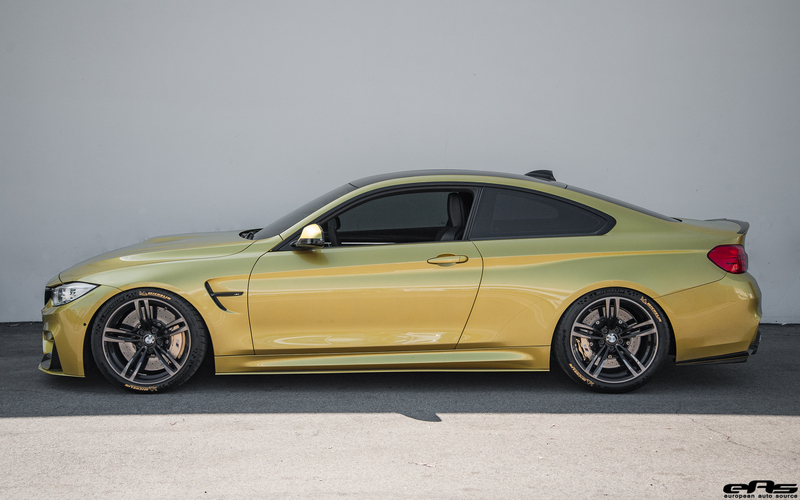 It is a bright finish, giving the high-performance coupe a staggering look that accentuates its aggressive body line. 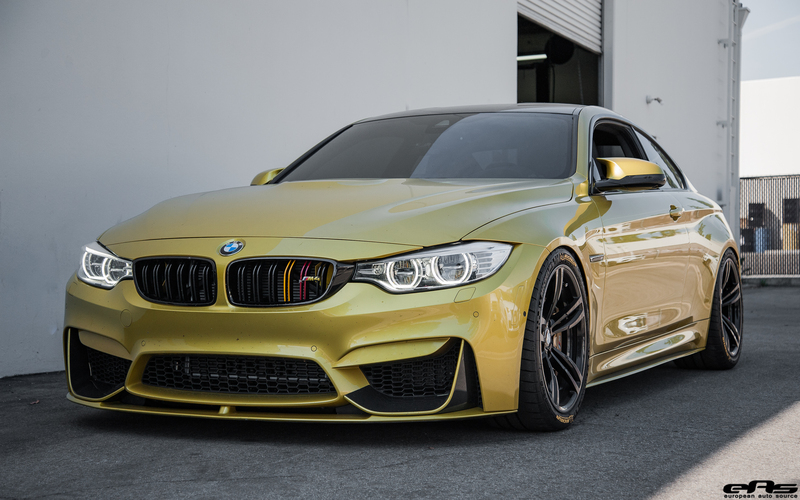 It’s no wonder that a lot of owners chose this particular finish for their M4. The bright exterior finish is matched by exhilarating performance of this vehicle, giving the owner plenty of thrills in various driving situations. But, for this owner, the stock looks and performance wasn’t enough. That’s why he turned to European Auto Source to give his vehicle a bit more of a custom feel. For this project, both the aesthetics and performance are upgraded. The bevy of high-quality aftermarket performance and visual additions now make it a perfect looking ride. One that even the purists will appreciate. 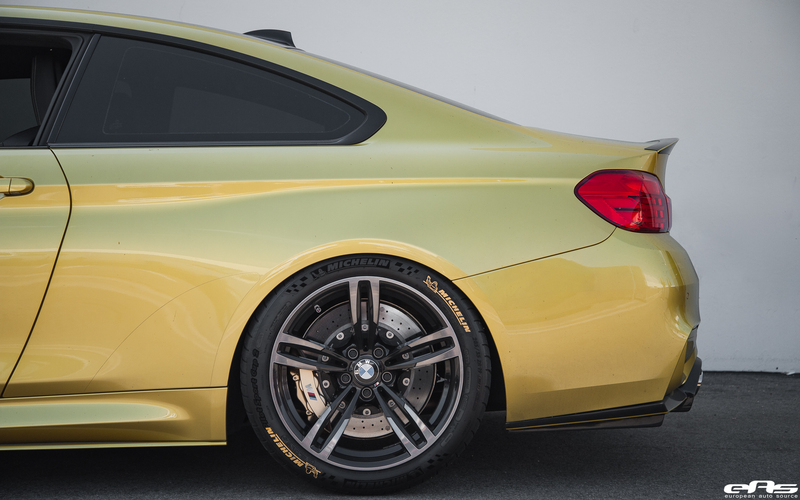 The build started off with a set of BMW M Performance parts. Namely, the BMW M Performance carbon fiber front splitters, the M Performance gloss black side markers, the side blade attachments and a carbon fiber rear spoiler were installed. Next in line was a set of iND additions. These consists of the painted front reflectors, painted rear reflectors, painted kidney grilles and a painted trunk badge. 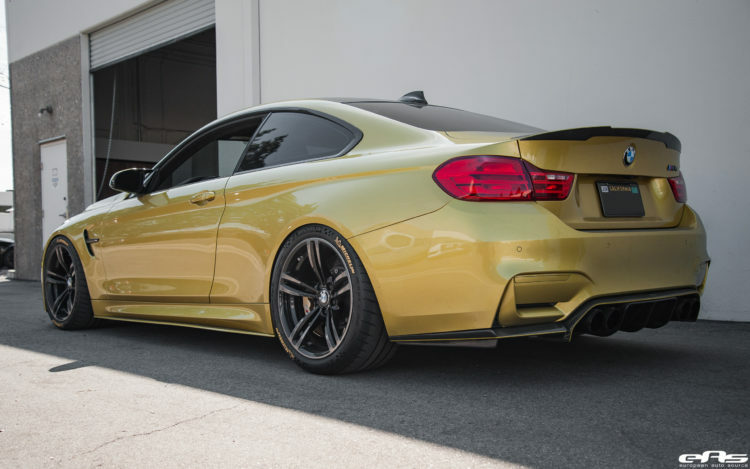 While cosmetic, these parts really give the BMW M4 a cleaner outer appeal overall. 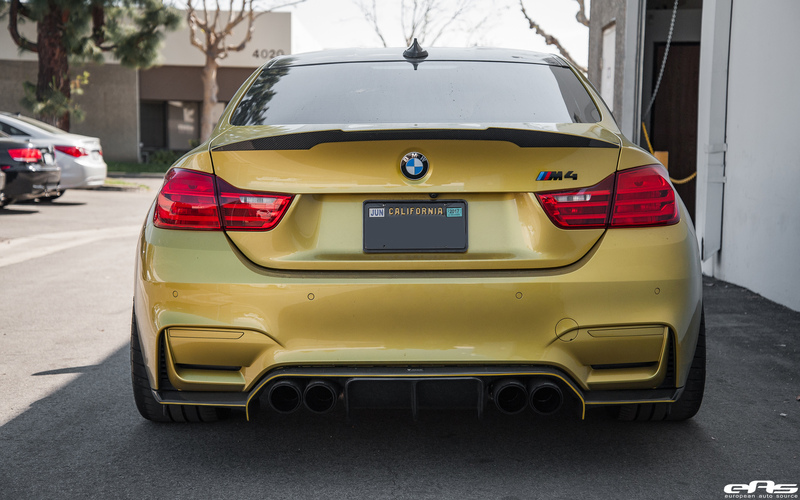 The finishing carbon fiber touch is done thanks to a Vorsteiner carbon fiber rear diffuser, perfectly matching the aftermarket exhaust system that was installed as well. The exhaust system is made by Akrapovic from high-quality titanium. The slip on exhaust system yields a nice power and torque boost, alongside the improved sound quality. 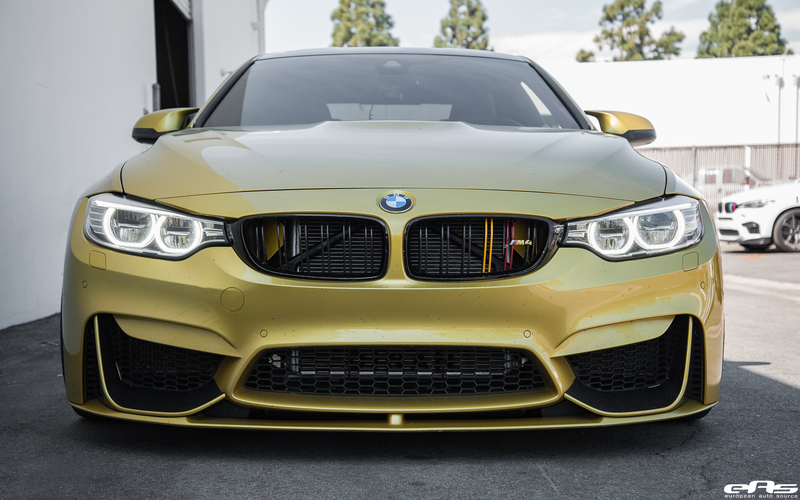 With this system, the owners of the BMW M4 can count on an upgrade of 7.2 horsepower and 17.4 Nm of torque. While not much, the combination of improved horsepower and torque, a lighter system, matched with improved sound, all make this a rather appealing addition to this vehicle. Finally, the vehicle also features an upgrade in the wheel department. While the owner kept the OEM wheels (which look really good by the way), he opted to give the vehicle a better stance overall. This is done thanks to a set of Macht Schnell spacers – with 15mm in the front and 12mm in the rear – alongside an upgraded suspension solution. 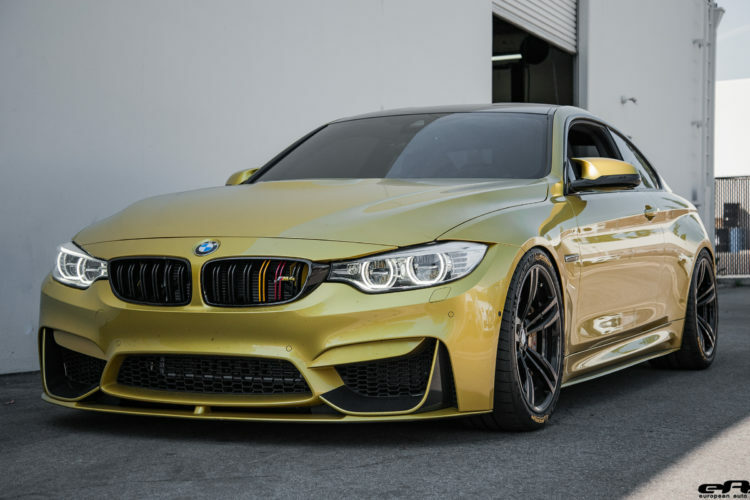 This comes in form of a KW Variant 3 Coilover system. 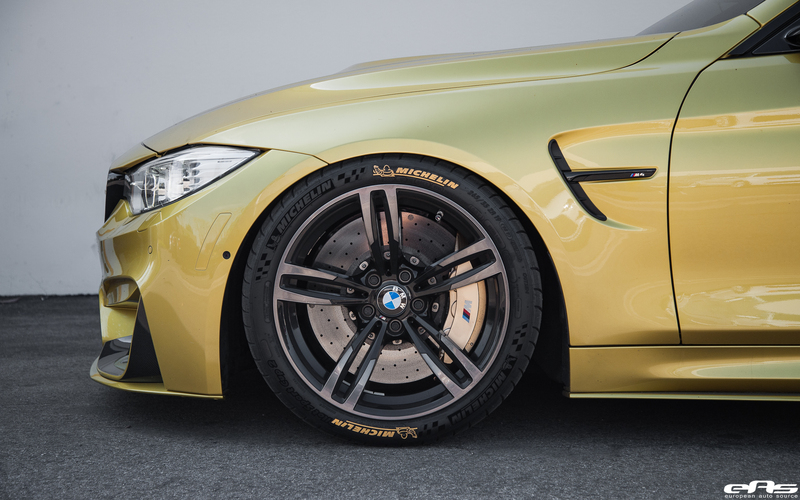 In turn, the owner is able to use the independently adjustable damping technology for both the rebound and compression damping, allowing the vehicle’s height to be set for street, track and drag usage. You can check out the complete build gallery below.